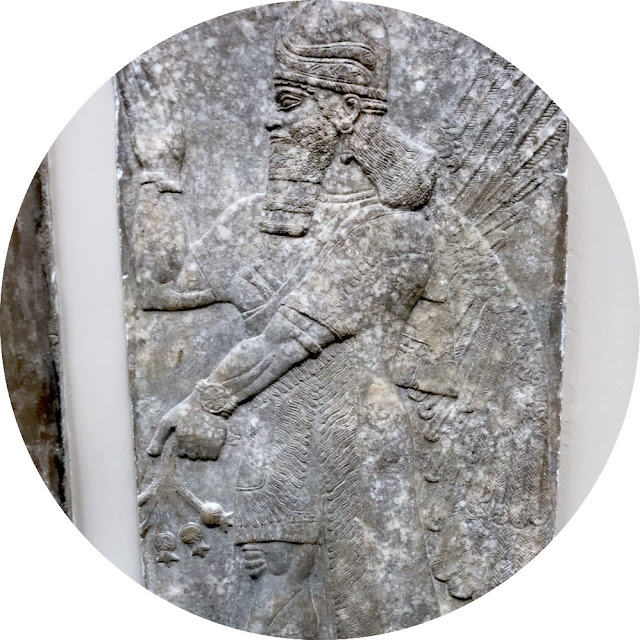 "Protective spirit" from Nimrud, c. 850 BCE, British Museum, London. If you turn to an early page in one of the dozens of books about the history of opium, there's a decent chance that you will run into the claim that opium use goes back to ancient Sumer. 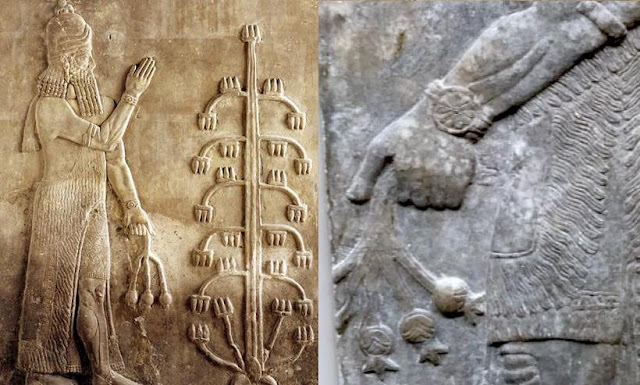 Specifically, the argument goes, the Sumerians called opium hul gil, meaning "joy plant," and memorialized their use of the drug in sculptures like the one above, which supposedly shows a deity holding poppy pods. This blog post is about how everything in the above statement is wrong. Why do I care about what is, admittedly, kind of a trivial detail? Two reasons. The first is that the history of opiates strikes me as a highly underrated topic. Despite the recent popular interest in opiate addiction and opiate production in the US media, the deeper history of opiate use and addiction rarely gets mentioned in major public forums. Based on my anecdotal experiences talking to members of the public (and teaching a history of drugs class at UCSC), there's a lot of interest in the topic, but very little popular knowledge about it—no Ken Burns documentaries, no best-selling books, no education in secondary schools. So when we do talk about the history of opium and other drugs, we should try to get it right. A second reason for why the "hul gil myth" matters is that it's a great example of how historical misinformation spreads even long after it has been proven wrong. The origin of the myth actually turns out to be a now-forgotten book from the 1920s, which was then debunked in the 1970s. But somehow that almost century-old error continues to have a life of its own. David O. Kennedy, Plants and the Human Brain (Oxford University Press, 2014), pg. 6. Virginia Berridge, Demons: Our Changing Attitudes to Alcohol, Tobacco, and Drugs (Oxford University Press, 2013), pg. 9. The list goes on. If you search "hul gil opium" on Google Books, you'll end up with over a thousand hits. In a classic 1997 Harpers article about his attempts to grow opium poppies, Michael Pollan notes that his interest in the topic was piqued by "read[ing] about what the ancient Sumerians had called 'the flower of joy.'" Hul Gil shows up on an official DEA website which claims the drug dates back to 3400 BCE, and in a PBS Frontline documentary about opium. Someone at the River's Edge Brewing Company even decided to name a golden ale after it. And, naturally, hul gil has made its way into Wikipedia. Although the core information (Sumerians, "joy plant," etc) remains the same in these accounts, the dates given range widely. As it happens, if there really were references to opium in 4000 or 3400 BCE, they would not only be the oldest references to a drug in history. They'd be the oldest decipherable written texts of any kind. Abraham Krikorian, a biology professor, was the first to map the tangled web of assumptions and misunderstandings that gave rise to the Hul Gil myth. His paper "Were the Opium Poppy and Opium Known in the Ancient Near East?" (1975) traced the origin of the claim that Sumerians used opium back to a British colonial official and physician named A. R. Neligan, who had served as physician to the United Kingdom's legate in Tehran and who published a 1914 book of "hints" for travelers to the region. Title page and frontispiece illustration of a book by Reginald Campbell Thompson (1876-1941), accidental founder of the Sumerian opium myth. Neligan's book The Opium Question (1927) erroneously reported that the Sumerian state dated back to "five or six thousand years before the birth of Christ" and speculated that Persian opium use was based on an older Sumerian precedent. 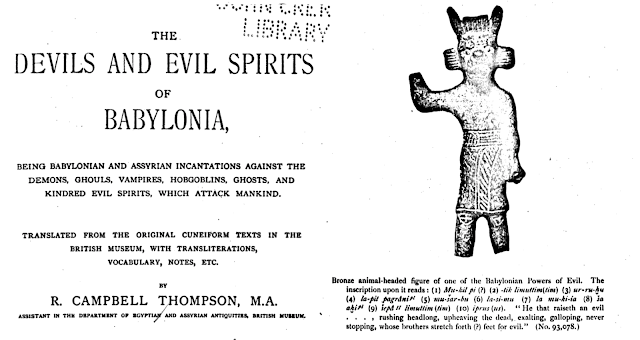 Neligan appears to have based this on conversations he had with a Cambridge archaeologist named Reginald Campbell Thompson, who had translated a series of Assyrian medical texts in the early 1920s and authored the wonderfully-titled book Devils and Evil Spirit of Babylonia. Thompson thought he'd found references to opium use in a set of Assyrian medical tablets that had belonged to an ancient library in Nineveh, and shared the information with Neligan. The tablets in question were from the 7th century BCE, some 2,000 years after the Sumerians. Thompson thought he'd discovered a word in them ("HUL-GIL") which was Sumerian in origin, and thus much older than the Assyrian civilization which had created the texts themselves. But the connection between this term and opium was based on the flimsiest of guesses. A fragment of a film that was apparently made at Thompson's dig in Ninevah in the 1920s or 30s. Raymond Dougherty, a colleague of Thompson's who led the Babylon Collection at Yale and assisted in translating the tablets in question, explained their reasoning. 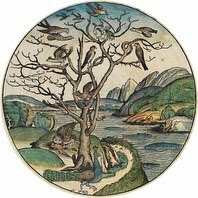 HUL, Dougherty wrote, was thought to mean "joy" or "rejoicing," while GIL "as a single ideogram represented a number of plants." Beyond this, things got ambiguous. "It may be suggested in a very tentative way," continued Dougherty, "that the Sumerians in their system of pictographic writing endeavouerd to depict the power of opium to produce a sense of delight." However, the only evidence we really have for this is the prior assumption that Sumerian "joy plant" simply must mean opium because... well, there really is no "because" here. It's a shot-in-the-dark guess that snuck into the scholarly record via a 1920s conversation between an archaeologist and a colonial physician. This theory was then "very tentative[ly]" entertained as a possibility by another scholar, and has been repeated as truth ever since. LEFT: Relief from the palace of Sargon II, 8th century BC. RIGHT: Detail from first image in this post. The image at left is from a restatement of the hul gil myth that has been shared nearly 500 times on Facebook. At right is a photo I took of an Assyrian bas relief when I was at the British Museum last month. Both images have been theorized to depict opium pods. But if we take into account that the textual evidence for Ancient Near Eastern opium is non-existent, it seems much more likely to me that they're simply holding pomegranates, which we already know had a significant symbolic role in Mesopotamia and which show up elsewhere in Assyrian art of the same period—and which happen to look almost exactly like the "poppy pods" that scholars have identified in other ancient artworks. 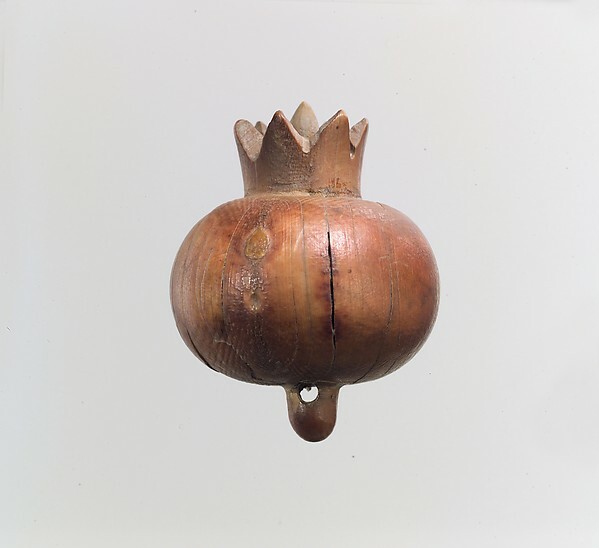 A Neo-Assyrian ivory pomegranate from 9th century Nimrud, via the Metropolitan Museum of Art, NYC. 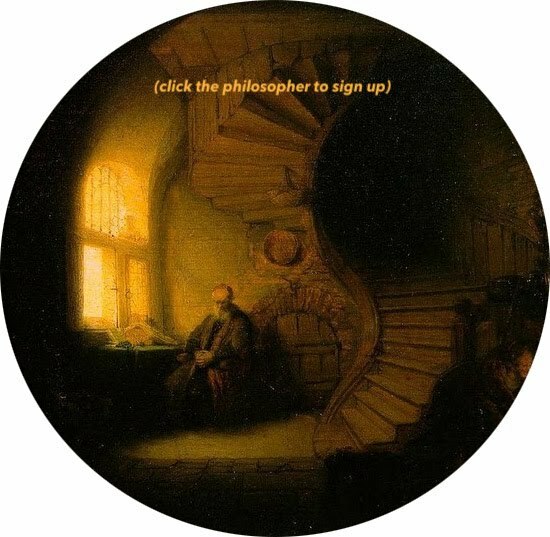 In the end, it seems that this early generation of scholars was completely wrong about the hul gil ideogram. We can't really blame them. After all, Dougherty and Thompson were working in a language which was still being deciphered, and were tasked with translating a set of technical and uncommon botanical terms. It turns out that the cuneiform that had been interpreted as "HUL-GIL" in the 1920s could also be interpreted as "UKUS-RIM." As best Krikorian could figure out—and he seems to have gone really deep when it comes reading the relevant cuneiform scholarship, so I believe him on this—the ideogram in question actually means something like "cucumber-like plant" or perhaps the unrelated plant known as bitter cucumber (Citrullus colocynthis). Thompson himself was aware of the confusion later in his career, but explained it by saying that the Sumerians used the term UKUS-RIM for both plants "because of the similarity of the poppy capsule to the small cucumber." Honestly, I'm not seeing it. These new finding debunking the older theory didn't spread widely enough. Some mentions of Sumerian opium use do hedge their bets somewhat (for instance, Antonio Escohotado, in his widely-read General History of Drugs, repeats the claim but adds "there is also argument against this.") The thing is, it's not an argument or a debate. As far as I can tell, it's a settled fact. I realize I'm getting into the scholarly weeds here. But I think it's important to pay attention to how myths about drugs originate and circulate. Drugs are not just a topic for niche scholarship. They're a major social force: our assumptions about drugs and drug history can reshape social policy, which in turn can directly impact the course of people's lives. And it seems to me that drug history is particularly susceptible to misinformation because the field has been neglected for so long by academic historians, and because there's so much distrust about official narratives relating to drugs. One example: I could write a whole other blog post about the "fact," circulated by Joe Rogan among others, that ancient Egyptian art contains drug-inspired depictions of the pineal gland, which is supposedly the part of the brain that contains DMT. I actually like listening to Rogan's podcast and particularly enjoyed his recent talk with drug researcher Hamilton Morris. But I really wish he would stop spreading a false claim about the history and biology of a genuinely fascinating drug (which maybe appears in trace amounts in human brains, in amounts orders of magnitude too small to be psychoactive). In the end, this kind of thing just adds to the mistrust and misinformation surrounding the whole topic of drug history. As is often the case in history, it turns out that the truth is actually more interesting than the fiction here. Based on the best guesses of contemporary archaeologists, opium actually turns out to be a drug native to western Europe. Opium poppy (Papaver somniferum) residue has been conclusively identified in analyses of early Bronze Age European agricultural sites in the Alps, and there's some reason to think that Papaver somniferum is native to this region. Although it's possible that the poppies were processed for their oil rather than their psychoactive latex, their presence in ritual burials (notably in a Bronze Age cave in Spain) point to the use of opium as a drug. Certainly by the time of the Greeks of the 5th century BCE, who widely interpreted Helen's use of a sadness-reducing substance called nepenthe in the Odyssey as a reference to opium, the drug had become widespread in the Mediterranean. A wall painting showing poppies, mandrakes, and cornflowers in the tomb of Sennedhem, Deir el-Medina. Via. The question of whether the Egyptians used opium in earlier centuries is still open. There's some iconographic evidence of poppy pods in Egyptian art, but we need to be careful about distinguishing between the opium poppy (Papaver somniferum) and its non-psychoactive cousins like the corn poppy (P. rhoeas), the seeds of which were found in a Middle Dynasty Egyptian tomb. Although it has been claimed that a set of jars traded by Cypriot merchants in the 14th century Eastern Mediterranean contained opium, this was recently disproven using chemical analysis of the residue. 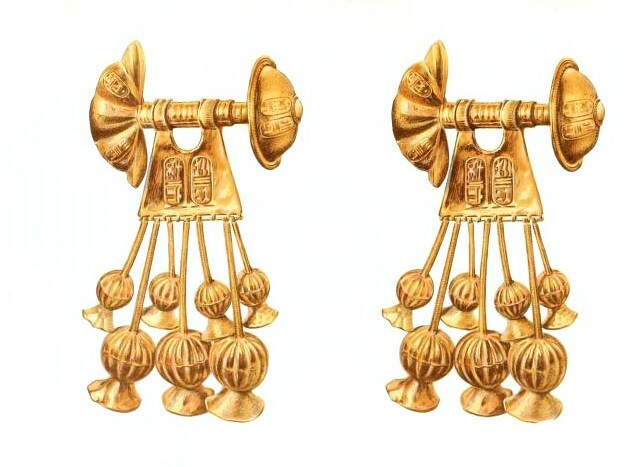 Gold earrings of Queen Tausret, circa 1190 BCE, possibly made in imitation of poppy pods. Via. In short, we're left with a story that's very different from what the public seems to think. Opium is actually a native European drug. It didn't reach Egypt, Persia or Mesopamia until the the classical period, some three to four thousand years later than the Hul Gil proponents claim. Opium use never disappeared in Europe (medieval and early modern drug manuals commonly mention the drug). But over the centuries, opium became associated with "the East" and disassociated from its European origins. With the opiate crisis constantly in the news, it's important to remember just how much we don't know about the history of drugs, and how much misinformation circulates. By assuming that opium is an Eastern product which was only relatively recently imported into Europe, we add to a centuries-old tendency to turn the scary drug of the moment into a hostile, foreign invader. The same thing played out with cannabis (which, like opium, was not hard to find in early modern European herbals) when it was rebranded as "marijuana" in an intentional effort to make the drug sound foreign to audiences in the United States. Why exactly did drugs with ancient histories in European medicine, like cannabis and opium, become transformed into foreign invaders? It's a topic that I'll pick up in a future post, but if you're interested, I've also written about it in a chapter that recently appeared in a book from the University of Pennsylvania Press. The book is called Entangled Empires, and the chapter is called "Empires on Drugs." Here's a preview courtesy of Google Books, and I'm happy to send the complete PDF of the chapter to anyone who might be interested. Just contact me via Twitter or email. - "Poppies in Ancient Egypt" from At the Mummies Ball. 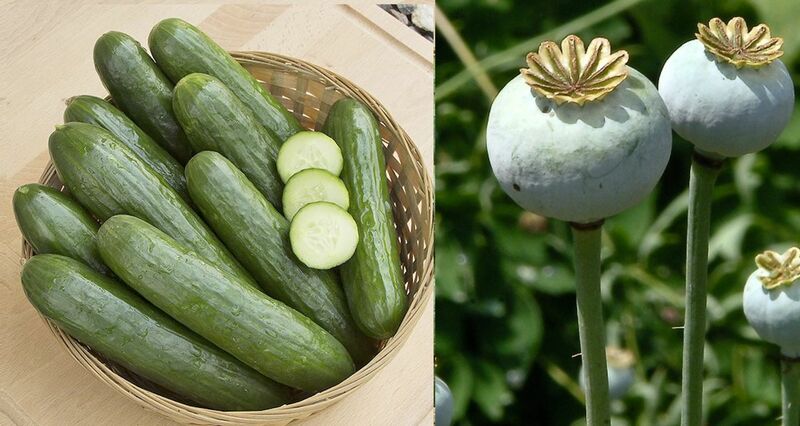 - "Poppy and Opium in Ancient Times: Remedy or Narcotic?" by Ana María Rosso.